AND LO! 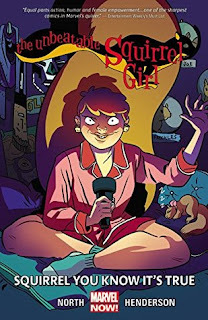 The heavens did part and deliver unto us, the unwashed and unworthy masses, another trade volume of Unbeatable Squirrel Girl, within which she smites a mighty Norse villain and sends her friend unto Asgard! Squirrel Girl's roommate, Nancy, is trapped in the head of the Statue of Liberty with a bunch of other random New Yorkers and is being held hostage. As one does in these sorts of situations (although only these sorts of situations after the Battle of New York), the hostages discuss which superhero will rescue them. The conversation turns to Squirrel Girl, with each hostage telling his or her Squirrel Girl story, the best of which is wildly inaccurate. Meanwhile, Nancy can't say anything about what Squirrel Girl is really like or risk compromising Doreen Green's secret identity. After Nancy's rescue (by SG, naturally), the duo meet up with Chipmunk Hunk and Koi Boi, other superheroes whom Nancy recognizes immediately as two of their classmates. We have a hilarious friendship montage, and then the villain appears: Girl Squirrel! Wait, what? Two girls who can communicate with squirrels, have prehensile yet fluffy tails, and superhuman agility? What are the odds? Leave it to Wikipedia and Nancy's Google-fu to realize that Girl Squirrel is actually the Norse god-squirrel-evil-thing Ratatoskr, once imprisoned but now free to scamper about at night and whisper evil thoughts in people's heads, effectively mind-controlling them. She even gets to the Avengers, who squabble a lot while Natasha looks on bemusedly. Doreen, Nancy, CH, and KB end up enlisting the help of ex-Thor and Thor, who hang out together, I guess. Loki pops in for a family reunion and the glorious havoc begins. 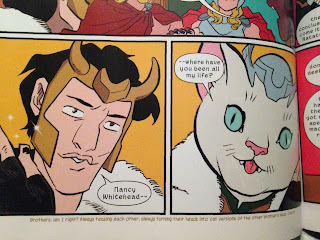 The absolute best part of this--aside from Doreen's bottom-of-the-page comments and the letters from the readers--is Loki turning into Cat Thor to fulfill all of Nancy's animal fanfic dreams. He literally plays out the entire story arc with a giant cat head with Thor's winged helmet perched on top. It is weird and wonderful and I am, as usual, in love with the Ultimate Trickster. Unbeatable Squirrel Girl is what I want from comics. I don't want superheroes fighting each other and having crippling bouts of angst so they can prove They're Just Like Us with Feelings and we can *relate* to them. I think the magic of superheroes is that they aren't like us. They're better or worse in exaggerated ways. They allow us to dream and to be more than who and what we are in our bodies on this earth. We can fly, be invisible, shoot webs, kick butts in bustiers, and run in heels without ever getting blisters. We can save the world even when it doesn't seem like it's worth saving. And we can have a ridiculous amount of fun doing it via superheroes, be they Justice League, Avengers, Fantastic Four, Teen Titans, or whatever other group you can think of. I want a comics universe full of heroes who have fun being extraordinary. And right now, I have a microcosm of that in The Unbeatable Squirrel Girl.